CHICAGO (WLS) -- Several homes were broken into in Chicago's Humboldt Park neighborhood in the last two weeks, police said. Authorities said the burglary suspects forced their way into people's apartments through the front or back doors. The first incident occurred in the 1000-block of North Avers Avenue between 12:50 p.m. on March 25 and 2:15 a.m. on March 26. Another home was burglarized in the 1000-block of North Kedvale Avenue between 8:30 a.m. and 2:30 p.m. on March 27. 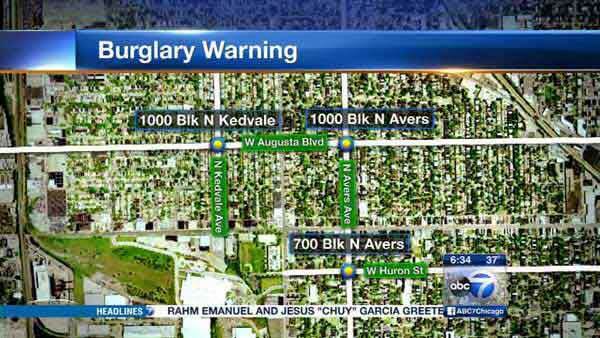 The most recent burglary occurred in the 700-block of North Avers Avenue between 4 p.m. and 10:30 p.m. on April 3. Police do not have a description of the suspects. Anyone with information regarding these burglaries should contact Area North detectives at (312) 744-8263.